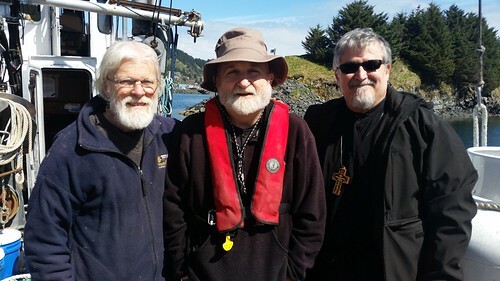 Servant-Leaders in Kodiak Alaska, members of the Men’s Group sponsored by St. Herman Theological Seminary and Holy Resurrection Cathedral “becoming disciples as we participate in making disciples” with Fr. David Rucker (right). Following vespers, OCMC Missionaries Fr. David and Mat. Rozanne Rucker gave a presentation at St. Justin Martyr Orthodox Church in Jacksonville, FL. They began their presentation by showing a video about St. Herman Theological Seminary in Kodiak, AK, where the Ruckers are based and where Fr. David Teaches Orthodox Theology, Missiology and Evangelism. The video highlighted the importance of the seminary to the local people and the preservation and future growth of the Orthodox Church in Alaska. Following the video, the Ruckers shared the history of their journey in missions. They spoke about their time as protestant missionaries, and how after becoming Orthodox they planted a church in Kentucky, before moving to Florida to work here, at the Orthodox Christian Mission Center. Fr. David’s time at OCMC led the Ruckers to a missionary assignment in Guatemala. It was while in Guatemala that they were then called to serve in Alaska, where they have been ever since. Missions has always been a part of the Ruckers’ lives, since both of their parents were missionaries. Fr. David spoke about the importance of missions and how central it is to our life in Christ. He said that without a clear mission, vision, and purpose, the Church, individual parishes, organizations, and even families will scatter. He said the first thing he teaches his students is that Orthodoxy is ‘a true understanding of who God is and a true understanding of who we are created to become’ and that our mission as Orthodox Christians is to ‘participate in making disciples while becoming disciples’. The Ruckers described the history of the Church in Alaska and offered it as a case in Orthodox missions. They talked about the Church in Alaska today, and the role it is trying to play. The seminary is at the heart of many of these efforts. They have begun to welcome people from Kodiak who are not enrolled in the seminary to attend some of their courses. They are preparing to receive more non-Alaskan students from the “lower 48” as well. Fr. David has started a men’s group, and Mat. Rozanne leads a women’s Bible Study, preparing leaders to continue and grow such ministries in the future. Fr. David and Mat. Rozanne have also been called on to help the Church in Alaska address some serious social challenges that the people there are facing, including alcoholism and family issues. They are able to do this because of His Grace, Bishop David's vision and leadership for all of the work in Alaska, and through able priests who have been there for years like Fr. John and Mat. Bea Dunlop and Fr. Innocent and Mat. Veronica Dresdow, and others who are so very faithful. The Ruckers welcomed prayers and support from all who attended, and thanked the parish for the support and love they gave which first brought their family to the Orthodox Church back in the 1990’s. Please pray for them and support their ministry work as well. The Ruckers also appealed for more workers in the mission field, either as short-term team volunteers or long-term missionaries. Please prayerfully consider joining Fr. David and Mat. Rozanne in reaching out to the people of Alaska.